We take children on to our nursery registration list at two years old. They are usually admitted into part-time nursery at approximately three and a half years old. Our main intake is in September every year when we offer places to children who will be starting school the following year. Ideally children would have 3 terms in nursery before they start reception. Nursery registration takes place every Tuesday 9.30 – 10.30.a.m. Proof of address and date of birth is required to complete the registration process. Priority is given to children who live in our catchment area. However, a place in our nursery does not guarantee a place in our Reception class. Parents will receive a phone call to confirm they still want the place by the end of April. This is followed up by letter confirming the offer and asking for confirmation in writing of parents wishing to take the place. Parents and children are invited to an open day where the children and parents meet the staff in the summer term. 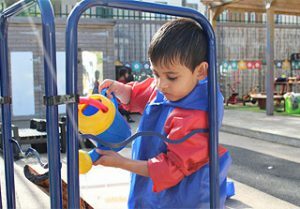 Then children and parents are invited to a number of stay and play sessions where the child, staff and parents get to know each other in the summer term. This is followed up by a home visit, in September, where two members of staff visit the child and parent at home. This enables individual and confidential conversations. At this point, we will take a copy of proof of child’s DOB and address. This information is held in school for one year and then deleted. We also need to be given an emergency contact; if parents are unable to supply us with an emergency contact then the Local Authority would be the emergency contact for the school. At this point parents are given a start date and a settling in period. During this settling in time, parents are asked to stay with their child for the first few days, depending on the level of support they need. We review our waiting lists regularly and if children on our list are due to start reception in the following September and a place has become available we will offer a place. We cannot offer the full induction process during the year but we always conduct a home visit. If there are still spaces and we have children on our waiting list, we do occasionally offer a place with priority given to older children whose birthday falls between September-December. This means that the child would have 5 terms at nursery. Every year the Local Authority publish guidance on starting school. The links are published on our website.